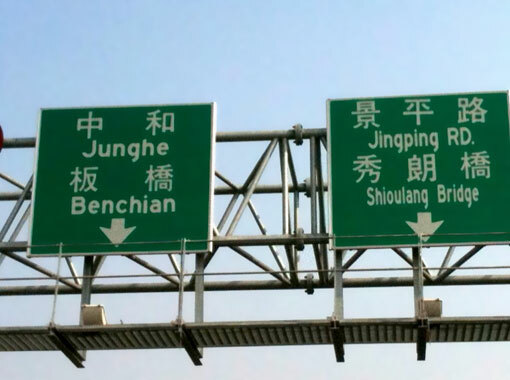 Poagao sent me this photo of signs on Zhong’an Bridge, which joins Xindian and Zhonghe (both in Taipei County). (So the zhong is probably for Zhonghe; but I’m not sure what the an is meant to be short for.) The signs are a good illustration of the sloppy approach to romanization in Taiwan. Because this is a new bridge, these are definitely new signs and thus should be in Hanyu Pinyin, which is official not just in Taipei County but nationally. As the table below shows, however, the only name that definitely isn’t written in MPS2 — the romanization system that predated Tongyong, which in Taiwan predated Hanyu Pinyin — is a typo. MPS2 hasn’t been official for the better part of a decade. I recently spent a few days in Tainan County and, as is my habit, paid special attention to the signage. Although the signage in the city of Tainan is primarily — or perhaps now exclusively — in Tongyong Pinyin (which is now supposed to be changed to Hanyu Pinyin), the situation in the remainder of Tainan County is not so clear-cut. Basically, from what I saw most Tainan County towns do not have street signs in Tongyong. Indeed, many of them don’t have street signs in any romanization system whatsoever. That one’s OK, as Tongyong goes. But as for the next two address plates, is it really too much to ask that the people who make signs learn what a baseline is and what it’s for, that sizes of letters should not be altered on a whim, and that amateurish font faces are not to be used? OK, so those were in Tongyong Pinyin. 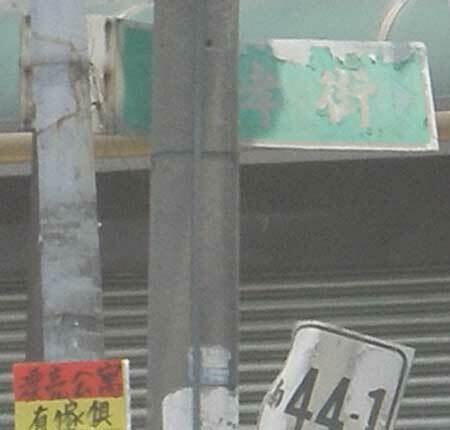 But two signs about one block from where the previous shot was taken reveal more of the picture of local signage in Tainan County. Tongyong most certainly is not the only romanization found in Tainan County. 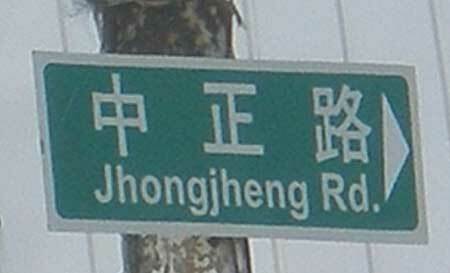 Together on one pole we have “JIA DUNG RD. 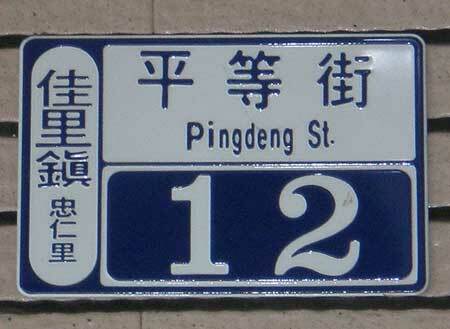 / 佳東路” and “Piandeng St. / 平等街”. 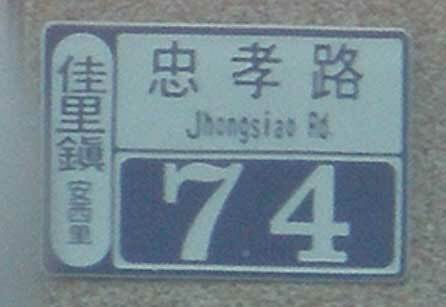 “Jiadung” is MPS2 for what in Hanyu Pinyin would be Jiādōng (Jiadong), while “Piandeng” is a typo (presumably from Tongong, as this is a newer sign that doesn’t match the style used on other MPS2-era signs in the area) for what in Hanyu Pinyin would be Píngděng (Pingdeng). 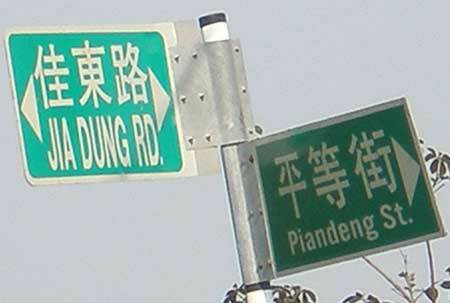 It would be spelled Pingdeng in Tongyong Pinyin as well, as can be seen above. And some signs have no romanization whatsoever and should have been put out of their misery a long time ago. 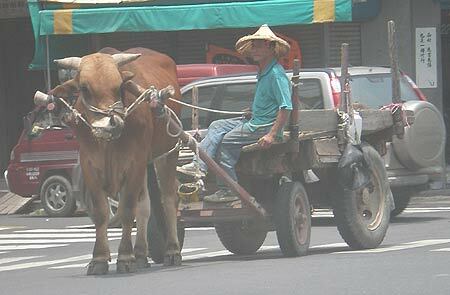 But all sorts of old things can occasionally be found on the streets of Tainan County.